I started cooking years ago with bulk foods. I was a huge fan of vegetarian cookbook authors such as Laurel Robertson, Carol Flanders, Anna Thomas, and Nava Atlas. It took a while to get the hang of it – 1.75 cups of water to each cup of brown rice; for wheat berries and oat groats, just cover with water, cook & drain. Dry beans get covered with several inches of water, boil for a minute, sit for an hour, drain, cover with several inches of water, cook until done. Good beans cook to soft; stale beans will stay crunchy no matter how long you cut them. It was a learning curve, but I didn’t have to throw out too many things as inedible. Some of it we preferred to never eat again, but most was good enough to at least eat. My favorite boy toy and I eat eat vegetarian about half the time. I still buy a lot from the bulk food bins at our locally owned health food store. It’s cheaper and fresher and they’re good staples to have in the pantry “just in case”. A handful of lentils, some dehydrated zucchini from our garden, a can of tomatoes, and some fresh herbs from the garden can make a pretty good tasting soup when we didn’t have time to go shopping for groceries. 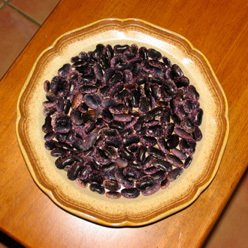 The beans in this picture are called scarlet runner beans. They’re huge, meaty and flavorful. I raised these the first year of my garden and loved cooking them up. They’re not easy to buy commercially, but they aren’t hard to grow in a home garden. Word for tomorrow – OBJECT. If you prefer to work ahead, see the list for the week under “A Word A Day”. Oh you are such a good person to eat all those beans. What really interested me was that you mentioned you dehydrated zucchini from your garden. Is that something you can do it a low convection oven? Or does it require a special dehydrator? I bought a nice dehydrator. With the humidity in Virginia, most things rot before they dehydrate. Even with that, I store them in the freezer until I’m ready to use. You could do it in the oven, but I’d use your cookie racks after they start shrinking so you get enough air flow around them. Here’s some simple instructions on doing it in the oven; if you Google it, there’s all kinds of things on dehydrating food / vegetables. I love my dehydrator followed by freezing. Canning is last – it’s so much work and mess. I’ve dehydrated summer squash, tomatoes, Swiss chard, apples, peaches, peppers and other things. I love the vegetables in soups, stews and casseroles. The fruit is great in oatmeal, yogurt, or just plain. Thanks for the info. I have dehydrate herbs in my oven before. Now I’ll have to consider experimenting further. The freezing of produce even though they were dehydrated is a good idea. You’re welcome. I usually dehydrate my stuff enough, but I like to freeze it as a just in case. It also helps kill any residual critters who might survive the dehydration process. Scarlet runner beans are new to me. They are very good – if you like legumes, these are definitely something to try. This place lists them for sale and it looks like they grow it themselves (I have not actually ordered from them though). The beans are great – if you like legumes, you’ll like these. The flowers are very pretty too and the bees love them!